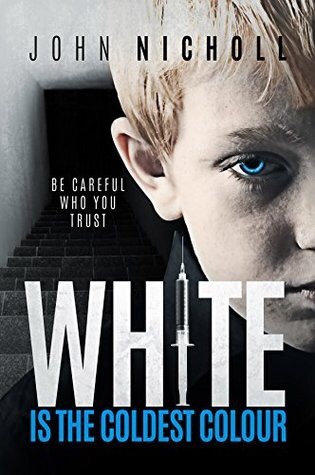 John Nicholl wrote a multi agency child protection good practice manual and articles for news papers and a national social work magazine during his career, but White is the coldest colour is his first novel. He has worked as a police officer, and as a social worker and operational manager for the child guidance service, two social services departments, and the NSPCC. He has also lectured on child protection matters at several colleges and universities. I had seen White Is The Coldest Colour on Relax And Read Reviews and also on Bytheletterbookreviews Goodreads page so I was aware of it before I got the email from John. I have to say, child abuse is a subject that I find hard to read so I was a little apprehensive before I started reading. However, once I got into the book, it was nowhere near as bad as I was expecting. White Is The Coldest Colour is a skilfully written book, full of detail that shows the authors knowledge of child protection. It’s portrayal of Dr. Galbraith is chilling, as we see into the mind of a sadistic abuser and the lengths which he will go to in order to control everything and everyone he encounters. I found myself rooting for the Mailer family from the beginning. Going through a separation, they seek help from Dr. Galbraith as their youngest son Anthony is having behavioural problems in the wake of his parents splitting up. I wanted to scream at the mum, Molly, when she says yes to seeing Dr Galbraith!!!!! The ensuing events in the book kept me awake later than normal in order to read as much as I could! More than once I wanted to shake the police officers as they just weren’t seeing things!!! As for Galbraith’s family, they were so far gone under his rule that they couldn’t see what was happening around them! I gave White Is The Coldest Colour 4 ⭐️ on Goodreads, I would highly recommend reading it! The second book will fill in many of the gaps. Life can sometimes change in as instant. Thanks for the review, it’s appreciated. Thanks for giving me the opportunity John! I really enjoyed it!